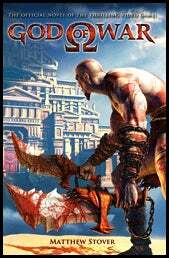 God Of War Novel Is 283 Pages Of "GGGGGRRRRR!!!!" For all its violence and bombast, God of War is built around a mythology that's thousands of years old. So the fact somebody is making a novel out of it may not be as ridiculous as you first thought. Then again, since it's based entirely around the events of the first game in the series, it may well be. Page after page of "I WILL STAB YOU IN THE FACE" followed by "AARRGGHH!!" broken up only by a few moments of "OH NO MY WIFE WHAT HAVE I DONE I AM A MONSTER". Written by Matt Stover, God of War (the book) will be out in March 2010, with further novelizations of the series to follow.